With a Twist, an Artist Resin Thoroughbred sculpted by Candace Liddy, on the sculptor's workbench. At some point, many Breyer and other model horse collectors start wondering how they too can make a horse model. How do you make a model horse from scratch? What tools, equipment, and supplies do you need to create the dream stallion prancing through your imagination? Each sculptor has his or her own preferred methods and tools, but there are some basics most use to create unique horse models. Before sitting down to sculpt, it's important to do two things. First, find a good reference photo showing a horse in a similar pose to the one you wish to create. Reference photos help artists create a realistic pose and keep the proportions and details correct. Slip your reference photos into a clear plastic sleeve called a sheet protector so that you can keep it on your workbench without worrying about covering it in clay. Second, purchase or find a book that shows the horse's skeleton and muscles. It's important to make sure your sculpture is anatomically correct. Practice makes perfect, and so does real life experience with real horses, so if you can, get to know a real horse. Watch how they bend their legs, turn and move. Breyer released a model horse called the "Visible Horse" many years ago that had the horse's anatomy painted right onto it, a helpful guide for anyone who wants to study how horses are put together. Another tool that some artists find useful is a jointed, proportioned wooden model of a horse that can be posed and studied for the correct leg positions. Model horse sculptures and equine statues are typically built on a frame. Most artists use a wire armature. 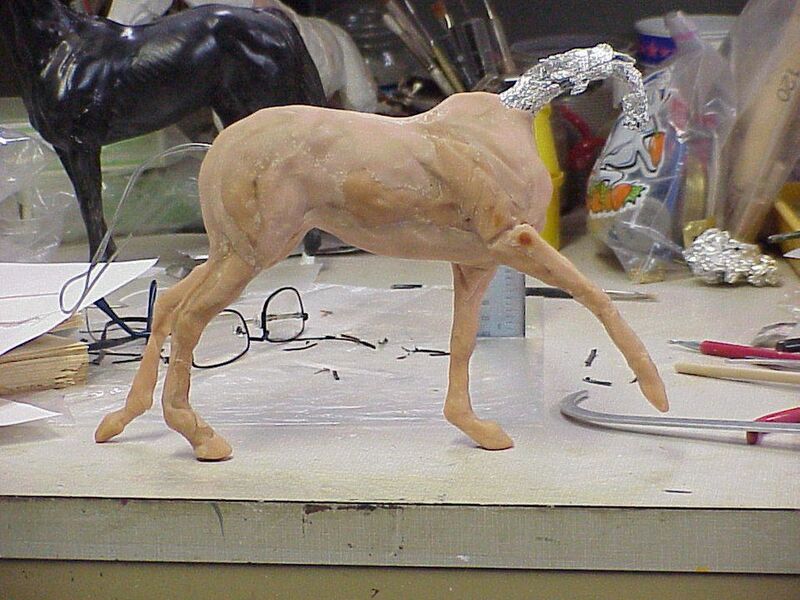 Wads of aluminum foil are added to the wire frame to form the rounded belly and other parts of the horse, and layers of clay are then applied to the top and smoothed, detailed and fashioned into the beautiful realism craved in a model horse. Modeling clay or two-part epoxy putty - if you plan to make copies or cast your sculpture, a two-part epoxy is best. Hobby clays and polymer clays that bake in the oven can crack during the typical resin molding process, and you don't want your creation to crumble into a million tiny pieces. Sculpting or modeling tools - some sculptors use their fingers to smooth the sculpting medium onto the frame, but basic sculpting tools, available at any ceramic store, make the task easier. Practice makes perfect, so don't worry if your first attempts don't come out quite right! Keep practicing. It's the only way to improve. Ask for critiques on hobby forums, bulletin boards, and model horse hobby clinics. It's not a good idea, however, to send photographs to a sculptor you don't know; only post photos to a hobby bulletin board, such as those on Model Horse Blab, that invite critiques. Most people will be encouraging but some may be harsh in their critiques. Learn to shrug it off. Every artist from the time someone first dabbed paint on a cave wall probably had to deal with critics. Be open to feedback, especially feedback to help you improve. Consider taking a workshop in equine sculpting or art. The International Museum of the Horse in Lexington, Kentucky, offers workshops on sculpting the equine. The American Academy of Equine Artists offers 2 and 5-day workshops to help new and experienced equine artists alike. Even taking a local sculpting or figure drawing class at your local high school continuing education program can help you achieve your dream of sculpting your very own model horse, just like a Breyer.